While the interior of a home is fairly easy to change as your tastes and styles morph over the years, the exterior of a home is usually a more permanent decision requiring more than the consideration of colour scheme or style. 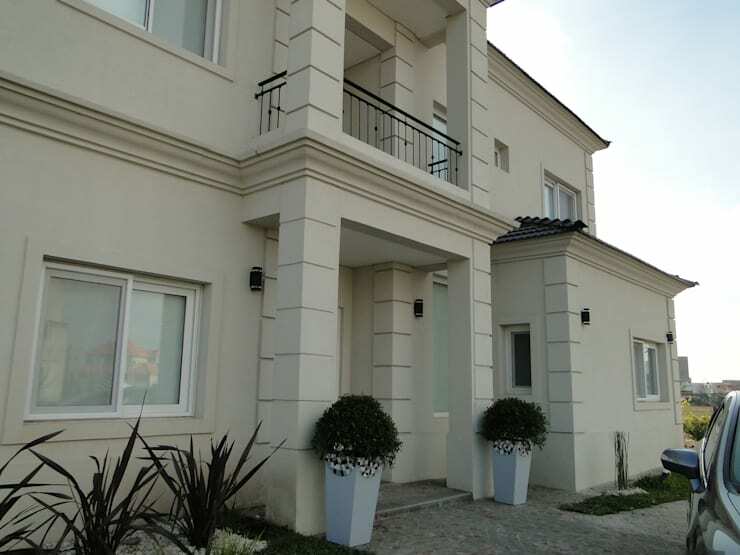 The exterior of a building also takes into consideration the durability of exterior materials, the surroundings that give the home context, and how the building structure is supported by the elements of an exterior design. Explore 7 of the popular house styles with us and you'll learn the main style elements that architects use to characterize each of them – if you're looking at building a new home or renovating the outer shell of an existing home, this guide is a quick summary of the style you can choose. Modern style is often characterized by a mix of high-contrast materials. In this example, the combination of warm wood, polished metal, and gray concrete creates a bold and beautiful set of textures. A characteristic feature of modern houses is their geometrically influenced shape and flat roofs, as well as frequently occurring terraces and large glass windows. 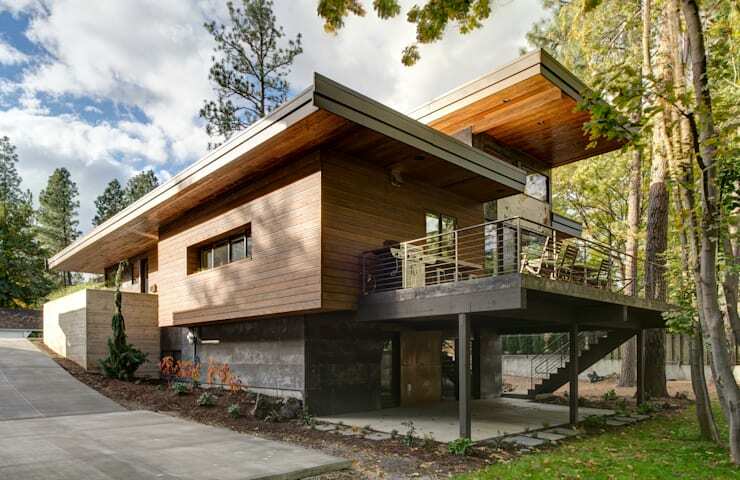 Modernity also lies in the lifestyle – as modern homes are built with current technologies, many of them make use of energy-saving materials such as solar panels, glazed windows, passive heating, and other marks of an eco-conscious home. Love modern style? Take a look at this ideabook with ideas for making your home more modern. 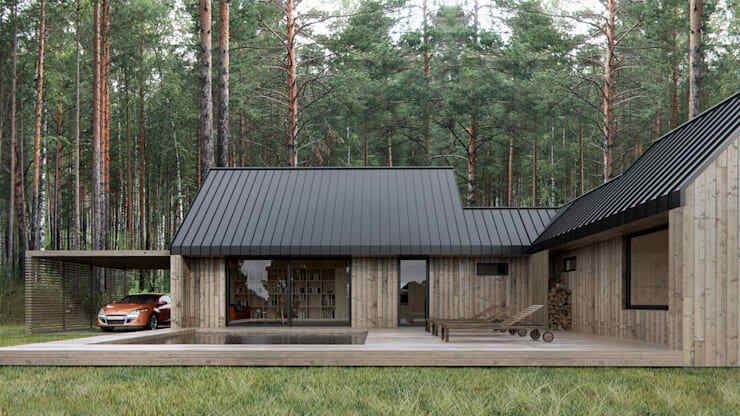 In minimalism, the idea is to hide as much as unsightly image detail as possible, which is why the example house in this image appears to lack both gutters and a foundation (both of which are, in fact, hidden in the design of this house). 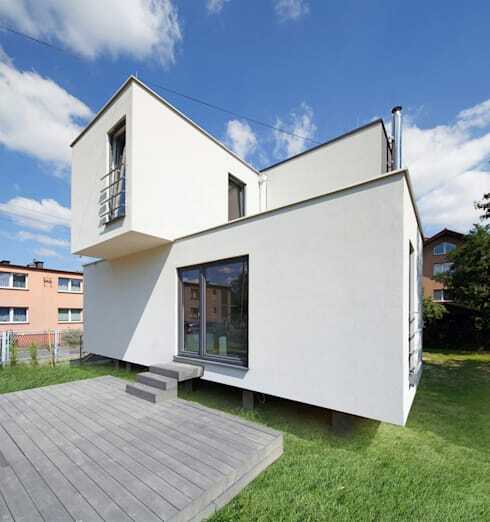 Houses in a minimalist style often sing of solid, smooth materials like concrete, glass and metal. Simple, unfinished materials and freshly-cut lines are the hallmarks for facades and interior finishes of a house adhering to a minimalist aesthetic. A country home is always reminiscent of simpler times, materials, and construction technique. Wood usually appears in large quantities, allowing these rustic homes to fit into their natural surroundings, and these houses often employ an iconic gabled roof covered with shingles, thatching, or clay tiles. This particular example shows a traditional white-framed window design against a high-contrast brown background in a simple two-tone design – typically, a country style home will keep the colour schemes to three colours or less. Houses in the south of Europe in this style are usually snow-white because they look faded under the influence of strong sun, but warm summer tones of brick orange, yellow and even red are also common. With hot climates, Mediterranean homes most often require shutters, which serve an important function for dimming the interior of the house as the sun reaches its high point. The architectural style of Mediterranean homes is also abundant colors of blue, which has been found over the years to act as a deterrent to insects. 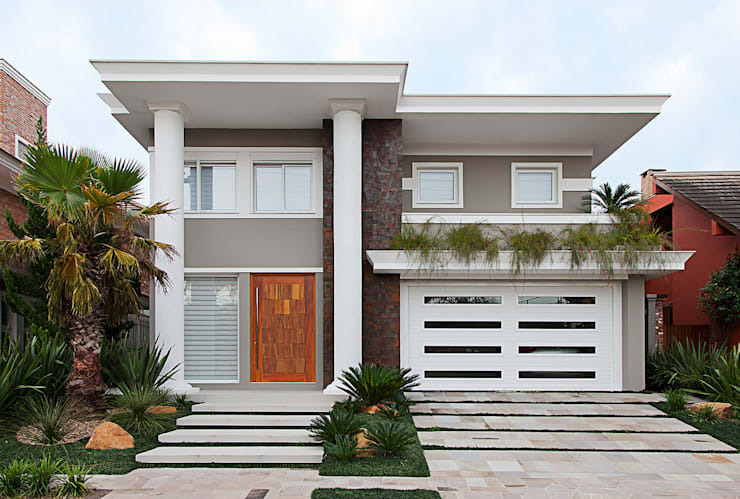 For a more natural material, a Mediterranean-style home can be found with a facade of natural stone. Classic homes offer a combination of simple, neutral white and beige colors with various ornaments or embellishments on the front-facing side of the house. Very popular in this style are pilasters and geometric solids, as well as horizontal recesses for adding style and elegance. Arches, columns, pillars supporting balconies are also common style elements. Welcoming doorways with steps are often lined with cast iron railings in the beautiful, curved forms with forged accessories and finishes. A Scandinavian style home is a combination of several trends of architecture. First, it must be environmentally friendly. It also must fit into the natural appearance of the environment, focusing on simple, uncomplicated designs. Materials are often lightweight, fine, or transparent in nature. Scandinavian style homes come in many combinations of materials, but what mainly distinguishes them is their vertical arrangement. 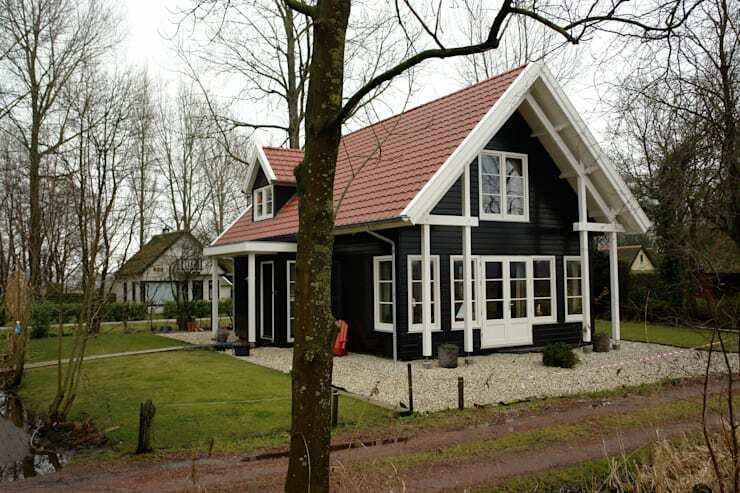 Today's construction of Scandinavian homes is based on natural earth tones, brown, and even black. You won't find ornate balconies and heavy balustrades in these homes – simple terraces and cantilevered designs are much more characteristic for a Scandinavian home. Along with the previous styles that define themselves by architectural themes, cultural norms, and geographical influence, there is another style that results from a deliberate – or sometimes, unintentional – mixture of these styles. Daring and unique, eclectic combination are risky and offer a dynamic approach to a home's exterior design. In this example, a flat roof adhering to minimalist aesthetics is supported by proud classical pillars, framing a facade with a modern mixture of materials. An eclectic blend can be tricky to pull off, but it offers the opportunity to create your own style, drawing upon multiple influences. What do you think of these popular house architecture examples? Comment below!